Le blog d'une fille comme les autres... ou pas! Laria : G oublié de dire que j'adore ton blog ! Kenzymen : Saluuut c'est Frambourgeoise sur mômes et ton blog est tout mignooon. MlleEcrivaine : N'arrête JAMAIS JAMAIS ce blog ! Haven : Coucou Shay! Comment vas tu? ça fait un bail que je suis pas venu sur ton blog! Haven : Oui une éternité même xD Tu m'en vois ravie! J'ai vraiment hâte de retrouver t'as plume! Je crée cette rubrique pour parler des livres que j'ai lus, que j'ai aimés (ou non). La lecture est ma façon à moi de m'échapper, et en l'espace des années que j'ai passées sur cette Terre en ayant le bonheur de pouvoir accéder à cet art, j'ai pu accéder à la connaissance de beaucoup d'ouvrages. PS: J'aimerais prévenir les éventuels lecteurs que, lisant à la fois en français et en anglais, je pourrais proposer des articles rédigés en langue anglaise. Je m'excuse donc de ceux que cela pourrait gêner et m'engage à publier une traduction (sur demande) de ces articles dans de brefs délais suivant leur publication. Cher lecteur, je suppose que l'univers délirant et époustouflant d'Harry Potter ne vous est pas totalement inconnu. Passionné ou non, les aventures du petit sorcier ne vous ont probablement pas échappé -du moins, pas entièrement. Je tiens d'abord à remercier J.K Rowling pour le bonheur qu'elle a pu apporter à toute une génération. 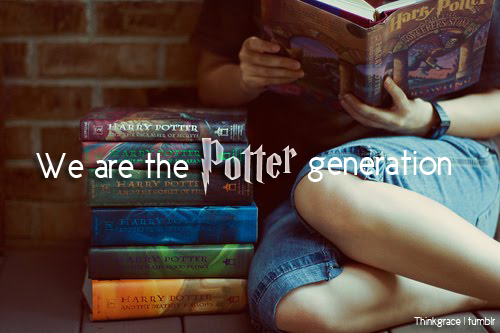 Eh oui, beaucoup ont grandi avec Harry Potter. On en découvrait un peu plus sur lui au fur et à mesure des volumes (ou des films, d'ailleurs) et en même-temps que lui, on découvrait un peu la vie..
Alors dans le palmarès des romans que j'ai le plus aimé, mon HP adoré est bien placé. Je crois que c'est le genre de livre qui vous laisse changé, complètement. Par l'histoire, par les personnages, par cet univers, tout simplement. On ne quitte jamais Harry, Ron, Hermione, Dumbledore, Hagrid... et tellement d'autres. Ils nous accompagnent, quoi qu'on en dise, dans notre vie. Il est là le talent de cette fabuleuse romancière. Elle est capable de créer ses personnages, de leur donner vie, et plus important encore, de les rendre attachants. On pleure et on rit, c'est aussi simple que ça. Ce n'est pas l'accomplissement que l'on attend, au fur et au mesure que l'histoire avance, mais il s'agit de ce cheminement, précisément. On aime à voir les personnages gagner en personnalité, en caractère. Ils apprennent à se connaître et on ne peut que les suivre. C'est un peu comme si on avait une fenêtre ouverte sur le monde des sorciers. On les observe et on sent ce qu'ils sentent, et tout est si vrai, bien qu'il s'agisse d'un monde purement fantastique. On y croit, nous, petits lecteurs, et on ne peut qu'admirer la grandeur de cette histoire. C'est un livre jeunesse, oui, et alors? Il s'agit pour autant, selon moi, d'un chef-d'oeuvre. Un livre qui vous transporte, un livre qui peut être lu et aimé par n'importe qui, à n'importe quel âge. Combien d'enfant ont attendu leur lettre de Hogwarts (Poudlard, dans la traduction française), croyant avec ferveur en cette magie que Rowling a su transmettre à travers les pages? Je ne ferai pas, ici, de résumé précis. En effet, je considère le début et la fin de l'histoire comme anecdotiques par rapport au déroulement. Et étant donné l'étendue des rebondissements, je trouverais irrespectueux d'ériger une simple esquisse de l'histoire. Tout ce blog ne suffirait probablement pas à explorer tous les côtés du roman, je souhaite donc en rester là. This is the kind of books that makes you laugh and cry and melt at the same time. I call this genius, I call this magic. So let's start with the plot. It's sort of hard for me to even call it a "plot" because it just all seemed so true to me. Like if it was a real story, no, not even a story. Just a life. Yeah, that's it. The Fault In Our Stars is a life. It tells abour Hazel, a girl who's dying of cancer. But that's not the kind of defeatist book, nor totally hopeful and happy book. It's between the two. Hazel is just trying to live the moment, because she knows she's going to die anyway. And she starts going to that Support Group for Cancer Kids. Then she meets Isaac, who gets to be her friend, and Augustus, who gets to be more than a friend to her. And, you know, whe just see her fighting against herself and against her illness, we see her trying to be a teen and falling in love. We get to know her, we get to appreciate her. She really has a unique way of thinking. I mean, she's not the kind of depressed ill girl we expect to see. She's more than that. Hazel has a great personality, and she's not afraid of saying what she thinks. Her vision of the world is sort of creepy, sometimes, but most of it it's just so... realistic and true. Hazel knows what life is, she knows so much while she's so young. She teaches the reader a lot of things and there are absolutely no clichés in what she says.It seems like she's able to look at our world without any judgement nor point of view. She just analyzes some situations and reports them as they are. I was honestly feeling both happy and sad for her because she really is a great person, we really don't want her to die. But that's the thing about that book: it doesn't tell what everyone wants to hear. It tells the truth, no matter what the consequences can be. I admire it. Her friend Augustus is also an incredible character. I won't tell you much about him, because there are so many things to say... He's really handsome and funny. Really, I laughed so hard when he was speaking because he has that staunch sense of humor. He never says he feels bad, he never wants to admit it. Because, even though he denies it all along, he really is sick, and he just can't accept it. Indeed, he lost one of his legs because of osteosarcoma (a bone cancer). He feels kind of invicible when he doesn't show his pain. Although, he really is fragile, emotive. And he loves Hazel more than anything. Basically, he fell in love with her the moment he saw her. Their love story is one of my favourites. I believe that they only are theirselves when they are together. They really are soulmates, I mean, they are able to talk for hours about breakfast (yeah, they atcually did) or whatever; and they never get bored because they just want to know what each other thinks. In my opinion, that is real love. And John Green remarkably painted it. But you should know, before reading it, that this book will change you forever. This book will learn you a part of life that you might ignore (and if you know that dark side of life, you'll probably recognize yourself in it). It'll show you happiness and sadness, and fun also. That extraordinary book taught me that no matter who you are, no matter you're healthy or sick, no matter you'll grow old or die youg, finding happiness is a choice anyone can make. 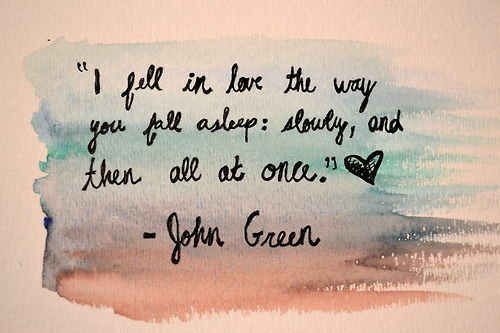 To conclude, The Fault In Our Stars in one of the books that made me love reading more. And that's a big thing because I already love reading pretty much. The whole time I was reading it, I just couldn't think of anything else (even when I was in school):that story obsessed me. I'm going to read it again, and again and again until I get bored of it -which I don't think will happen one day. I wanted to say thank you to Mr Green who just changed my life, my vision of things (I totally mean it). And I hope you guys will read it, and enjoy it as much as I did. The Perks Of Being A Wallflower is my favourite book of all times. It really is. Just take a look at the wallpaper of my blog: that is a quotation from it. During this article, I'll try to explain you why that book became so important to me by the moment I read the first words. So I'll proceed making a list. Incidentally, I bet it's going to be sort of long (the plot summary plus the list, I mean). But before starting, I'd like to tell you about the plot, the concept. Indeed, it's sort of unusual: Charlie, the main character, is writing letters to you, reader, because he just feels alone, abandoned. You're helping him through a really hard time. Actually, his best friend committed suicide the year before the story begins. As he already was fragile since the loss of his aunt (who was his favourite person in the world), he's just totally depressed and afraid of going to highschool don't knowing anyone. And, like you can imagine, it's hard for him to make friends since he is really sensitive and introvert. He'll write letters to you as often as he can, not to feel too alone. And, progressively, you'll see him grow up. When he meets Sam (with who he falls in love at first sight) and Patrick (her adorable gay step brother), he's introduced to a world he doesn't know. Effectively, he's never really spoken to anyone outside of his family since his friend died, and then, he'll go to parties, try drugs (first, don't knowing it) and have girlfriends. He's going to participate, as his teacher told him to, instead of just looking at things from the oustide. During the whole book, he's going to be both happy and sad. He's going to try to discover who he really is, find he wants to be a writer. He'll try to figure out love and all it involves. And that progression is interesting because Charlie is such a touching guy. He's really innocent and pure. No matter what he writes, he genuinely feels it. Always kind with everyone, he never judges people before getting to know them. I promise, you cannot resist adoring him. Many times, I just wanted him to be next to me. I wanted to hug him tight. It can seem completely crazy to, like, feel so close to a book character but that's what happened to me. Because it was so beautifully written, because Charlie is lovely, because I love reading letters, or perhaps because I believed in his story. So, let's get it started with my list. 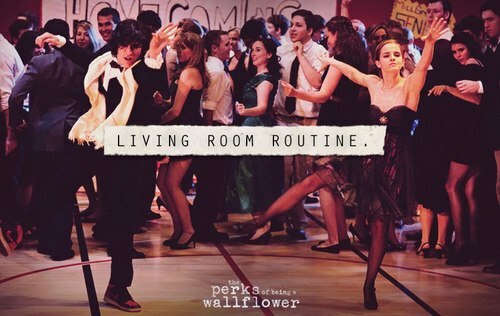 Why am I litteraly fond of The Perks Of Being A Wallflower? 1° Because, someway, Charlie looks like me. I'm also kind of awkward with people, a bit introvert. I love, as he does, reading and writing. I'm really close to him, and it touched me partly because I could recongnize myself in his character. 2° Because that book is realistic. We are immerged in the universe of teenagers, with absolutely no preconceived ideas. That's a bit what we are living (or have lived), you know. 3° Because it made me cry. And that's not usual for me to cry while reading, I swear. I didn't only cry during the sad parts, but also during the happy ones. It meant so much to me and it was so ingenuously described. Charlie is kind of stuck in his own world, and he sees things and understands them in his own way. But it feels like he's always right. He always finds the pit of things. He's a wallflower. 4° For the songs. Actually, that book made me know a lot of songs and books that I hadn't heard about. Like the song Asleep, by The Smiths. The author put a a lot of things he loves in his book. 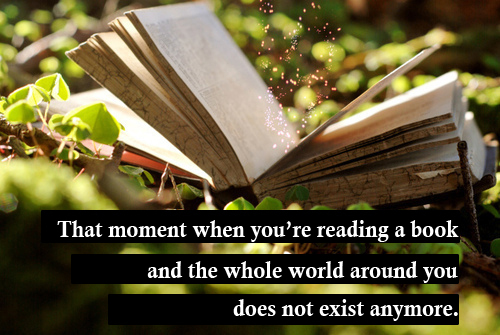 And, to be honest, that's a reason why you really shall read it. 5° For all the sentences you can quote. This is the kind of books that's so true, and telling so much things you can applicate to your own life. "We accept the love we think we deserve" is one of my favourites. 6° Because it tells about the kind of people everyone always ignores. There are lots of Charlies. Lots of Wallflowers, everywhere. And Chbosky chose to give them a chance to live, to be loved, throughout his book. 7° For having felt infinite (read it, and you'll understand).